No More Post Hole Digging! 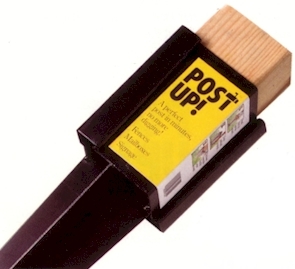 Use Post Up over and over again for temporary applications, or depend on it for permanent applications. 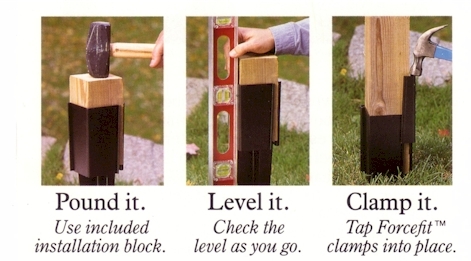 Post Up saves up to 30" of lumber per post by keeping wood above ground and eliminating the need for expensive pressure treated materials. Welded steel construction with high tech baked finish is better than galvanized- 100%enviromentally safe, guaranteed against rust perforation, and clamp and weld failure for 25 years! Finish in matte black to blend with variety of settings, Post Up is also paintable for a custom look. With Post Up , there's no hole-measuring and adjusting depth is eliminated. Post Up designed to accept standard 4" x 4" posts (actual dimensions 3 ½" x 3 ½"). Post Up is available in 18" depth for short or temporary posts; 24" depth for normal applications; and 30" depth for ultimate stability. We offer a wide array of sizes to fit almost any need. Use our online door sizing tool to quickly determine which size door you need. A Perfect Post in Minutes! Copyright © 2019 Gordon Corporation. All rights reserved.